Complete our registration and age verification quickly, safely and securely. Make your initial deposit and get a bonus added to your account. 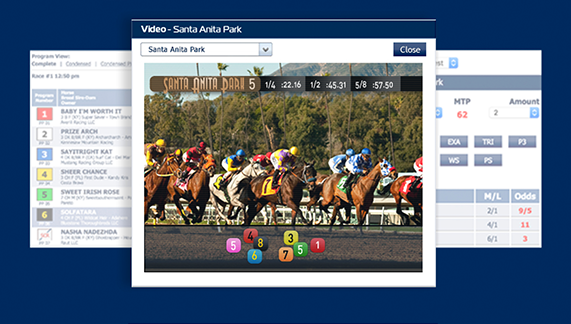 Make your wager and watch the action online live, as it happens. We're dedicated to giving you the best wagering experience. We've designed our interface to give you everything you need - and then get out of the way. Transfer your money to your bank account anytime, for free. We accept MasterCard and VISA. You can always increase your limit by authorizing your card. Use cash to fund your account at your nearest Family Dollar, CVS, 7-Eleven or Casey’s General Store. Use Neteller to instantly withdraw funds from your account. Head to tracks and OTBs across the country and conveniently deposit your funds with a teller. Mail a personal check, certified check, or money order with no minimum deposit amount - for free. Wire unlimited funds - and if you deposit over &dollar;250, it's free. Green Dot is a new deposit method at the register. Instant deposits and withdrawals, and the ultimate convenience. Fund your account with cash. Available at Walgreens, Rite Aid, Kroger and more. Instant access to your money. Get a check within one business day, with no charge for standard delivery.